Home » Oils for health » Evening primrose oil » Evening Primrose Oil for Oily Skin: Stop That Shine! Ever heard of using evening primrose oil for oily skin? Since I turned 13, I always suffered from oily skin. I kept asking myself, “why is my face so oily all the time”? Now, more than 20 years later, my skin is still oily, but over time I found some natural remedies that help to stop my skin from producing excessive oil. Using evening primrose oil for oily skin is one of them. “Why is my face so oily all the time”? If your skin is producing excessive oil, it means that sebaceous glands working overtime resulting in the excessively oily skin. Too much sebum produces surface oiliness, blocks pores, provides nourishment to bacteria that cause acne and pimples. But why some people are blessed with smooth, silky looking skin, and others, like me, have a shiny, oily, greasy skin? One of the reasons might be Linoleic Acid deficiency. Oily skin owners have reduced levels of linoleic acid in their skin. People with such skin types actually have more oleic acid and less linoleic acid in their sebum. Same results were found in a study, published in the Journal of the American Academy of Dermatology. Scientists have found, that “acne patients have also been shown to have low levels of linoleic acid in their skin surface lipids”. This leads to a thicker sebum which blocks pores and breakouts. And, as we know, most of the acne sufferers have oily skin. Linoleic acid, or omega-6 fatty acid, is one of the two essential fatty acids, that our bodies cannot synthesize and the only way to get it from the diet or supplements. Evening primrose oil is one of the best natural sources of Linoleic acid. The content of l linoleic acid in evening primrose oil is 70% -75%. It is the highest concentration compared to other well known natural sources of Linoleic acid (e.g. soya lecithin (45–60%), evening primrose (65–75%), amaranth (20–50%), pumpkin seed (45–55%), and borage oil (40%). There are two ways of using evening primrose oil (EPO) for oily skin – internally in a form of supplements, or topically. Many people try to combat these issues by scrubbing, washing with harsh products or using alcohol-containing toners. That was I was doing for quite a long time, but I never got sufficient results. On the contrary – that caused my skin to over-compensate for the reduction of oils by producing even more oil. This vicious cycle ended, when I started to apply evening primrose oil topically on my skin. Usually, it is the part of my evening routine. I like pricking an evening primrose oil capsule using a safety pin and rubbing the oil directly on the skin, including the neck and décolletage area. I like using Evening Primrose Oil from Sports Research. Each capsule contains 1300 mg of EPO. It is pure primrose oil, without other additives, non-GMO, without artificial colorings. You can use pure liquid evening primrose oil topically on the skin. Just a few drops of Zongle Certified Organic Evening Primrose Oil are enough for the entire face. Or you can only use it straight up on acne bumps instead of applying it on your whole face. If I notice acne scarring or dark spots left after a pimple is gone, I like to prepare my own powerful mixture of even parts of evening primrose oil, tamanu oil, and carrot seed oil. I usually do 2 drops each which are enough for one-time application, so there is no need to store this mixture and be afraid that it goes rancid. In the morning I wake up with a much less oily skin. You most probably heard, that most of the skin problems should be best combated from within. 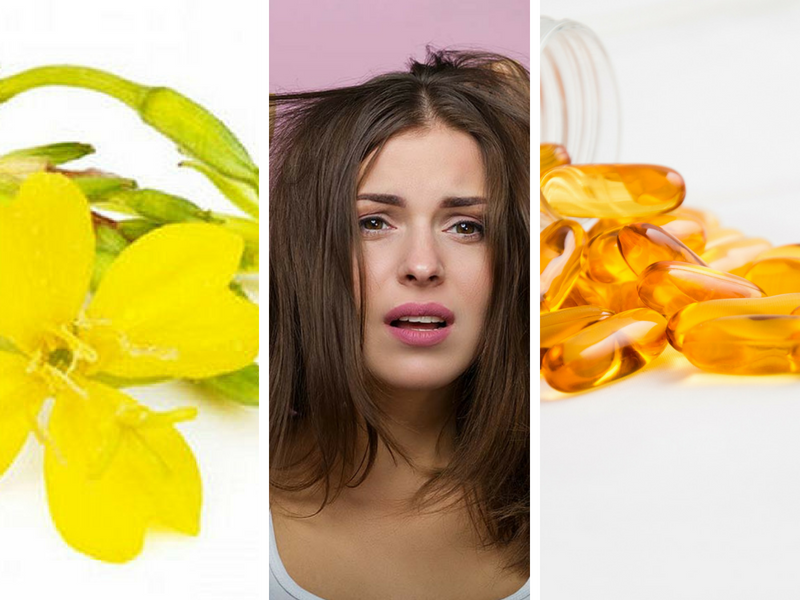 Consuming evening primrose oil in a form of supplements would have a great effect on oily skin and an even better effect on acne healing, as it helps to combat hormonal disbalance problem internally. Take one evening primrose oil capsule (500mg) twice a day, 1 in the morning and 1 at night, to supplement your body with the nutrients to clear up acne. If you notice that your pores are often clogged and filled with oil and gunk, no matter how thorough you cleanse and exfoliate your face, then probably you are “blessed” with excessively thick sebum. Taking EPO can help with thinning sebum and stop pores from clogging. In this case, increase the dosage of evening primrose oil for the oily skin up to 1300 mg per day. Evening Primrose Oil from Sports Research has a perfect dosage for these needs. In some cases, when extremely oily skin goes along with bad acne, the dose of evening primrose oil could be increased to 1-3 capsules of 1000mg each per day (but no more than 3000mg). As always be safe and check with your healthcare provider before starting to take any herbs and supplements. If a home remedy worsens symptoms, stop using it, and contact your doctor or a dermatologist. 2 commentsOn Evening Primrose Oil for Oily Skin: Stop That Shine!